1. Select File > Export > Render Network or press [Ctrl] + [Shift] + [Y] (Windows/Linux) or [⌘] + [Shift] + [Y] (Mac OS X). 4. 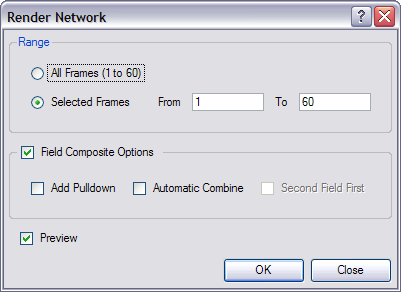 Select the Field Composite option if you want Harmony to render the final images as fields for display on interlaced monitors.